The Etnies Marana now comes in three vegan colorways! 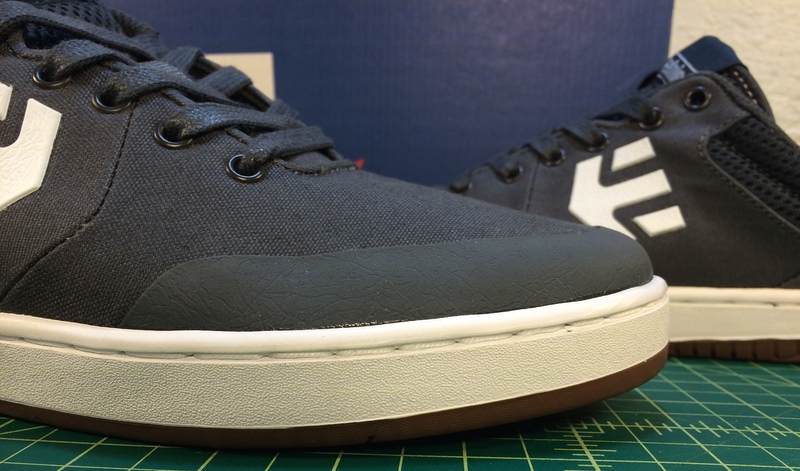 It has been about a year since the release of Ryan Sheckler’s pro model; the flagship of Etnies skateboard shoes. The Marana features a number of technologies for a better performing, longer lasting skate shoe and still manages to catch a few notes of style from the early days of Etnies. Vegan Skate Blog received a pair for a first look skate review and we eagerly started to shred. Here is what we found… The canvas and mesh upper of the Marana does not equal your typical canvas shoe. The stiff rubberized toecap is what most distinguishes the shoe most from other models. Though its a trend, we’re seeing more and more of this for good reason. Subtle stitch lines and panelling protect against blowouts. The mesh tongue and collar keep the shoe breathing. To sum it up to one word, the Marana is solid. …but lets extrapolate. The rubber toecap is nothing new to skateboard shoes; think Chucks or Vision. The Marana toe caps are more reminiscent to that extra piece of material you’d find on just about every cupsole on the block from the late 90’s. While that was the spot a rip would turn into a blowout, thats not the case here. The rubber is bonded in the toe cap and imbedded into the sole with no top stitching. Your toes have plenty of room to move around, they’re protected from moderate impact, and the board flick is smooth. The inner-sidewall reveals the otherwise hidden seem of the toecap. Far from the heavy wear of the ollie area this is more protection against blowouts. Thats not the exciting thing on this side though. From the seem line all the way to the mesh of the collar is a stiff stabilizing panel. 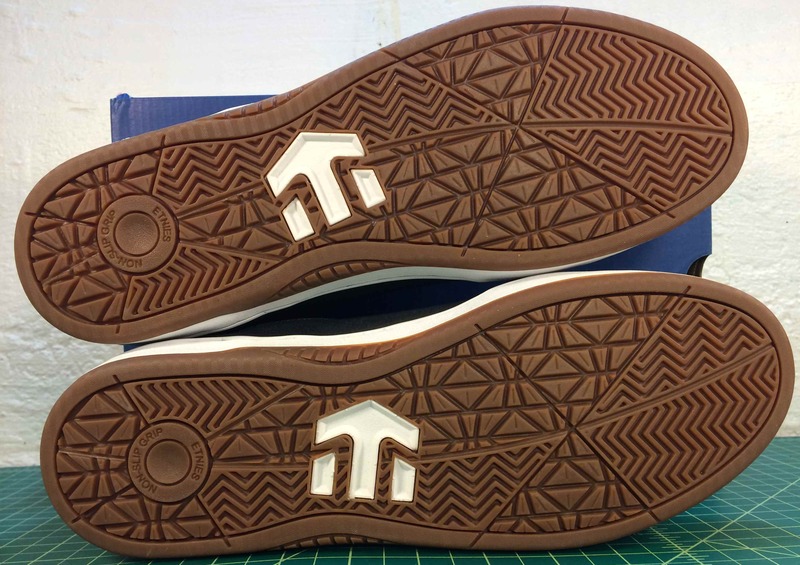 The panel not only keeps the shoes holding its shape, but it protects the inner sole. Think of all those times a board caught you by surprise, right in that most tenderist of spots. Not with the Marana. Let’s hear it for mesh tongues! 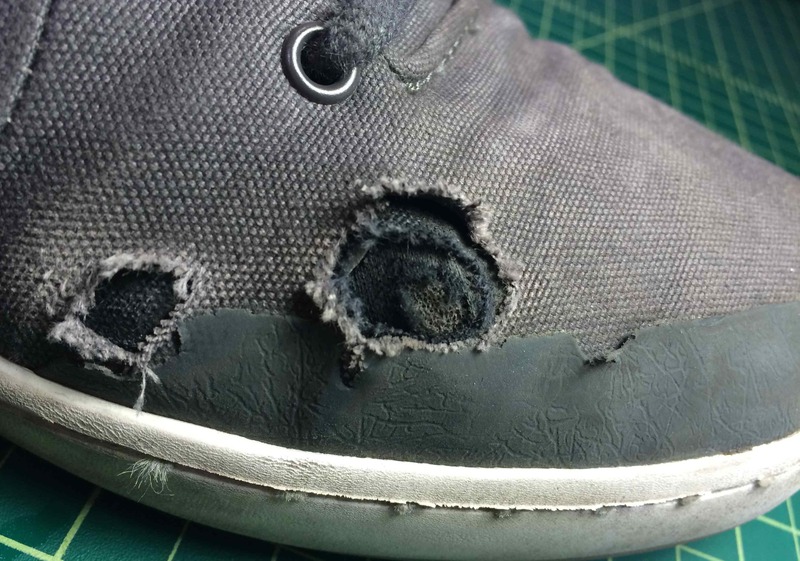 What once was a staple of skateboard shoes seems to have gone the way of the dodo. The Marana tongue is all mesh and even has a lace stabilizer. Your feet stay cool and the tongue stays in place. The waxed laces are also surprisingly durable! The insoles of the Marana are incredibly cushy and cupping. Just what you need for jumping ten to twelve foot drops into flat-bottom . After all this is Sheck’s shoe and if you have ever seen some of the stunts Ryan is known for, it all makes sense the moment you give the insole a squeeze. A nod to our noble legacy; Remember kids, scooters evolved from skateboards. Don’t devo. 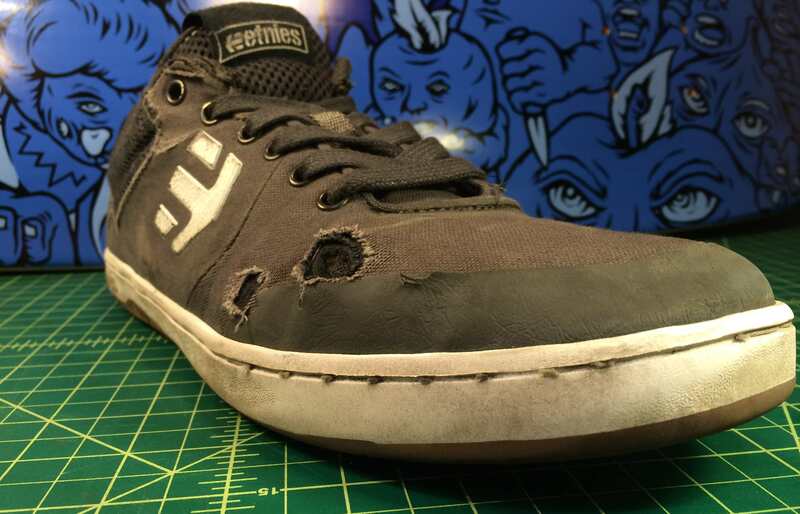 Etnies, Non-Slip Grip! Those little heal logos bring tears to my 30-something eyes. No joke though, the gum soles don’t slip. The big Etnies “E” in the center of the shoe is all foam too, “sti Evolution Foam” to be exact. This lines the footbed and provides that cushy ride. Despite the cushiness, the flex and board feel leave you wanting a bit more. Even with the fancy cuts and patterns and a decent amount of break in, the Marana can be stiff. After 20 hours of skating, it still maintains the solidness that really typifies this shoe. The non-slip grip is still not slipping even as the patterns disappear into the grip tape. 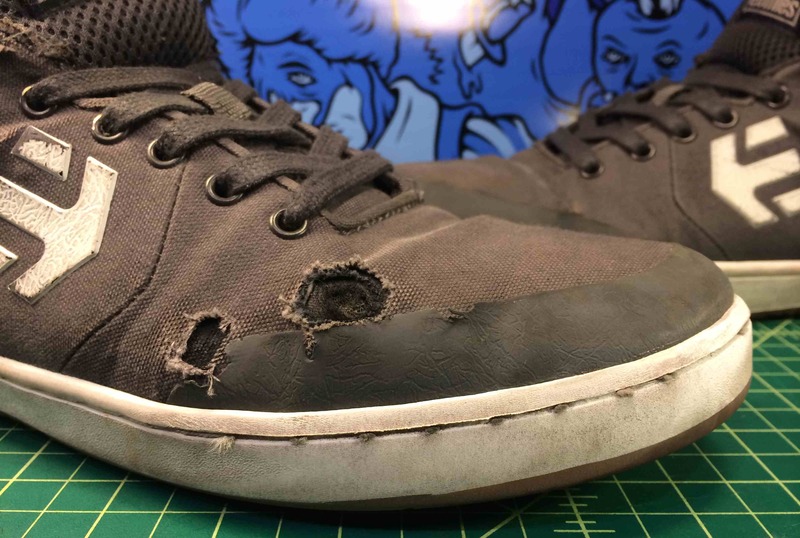 Ollie holes are still a real thing despite toecaps. But you have to consider the important balance of form and function. If the rubber came up any higher the shoe would certainly have a considerably different feel. While the process is delayed, nothing keeps any shoe from certain death. At the point pictured above, lets say the shoe is wounded at worst. The real win is for flip tricks. The flick area at the tip of the toe is going to withstand much more stress thanks to the toe cap. A closer look at the ollie hole shows off something interesting. Four layers, count’em! Canvas on canvas on liner on foam. Kinda cool to look at, but further more it gives an idea of the thought and design to the Marana. Etnies is creating skateboard shoes for the future while giving a nod to their legacy of amazing footwear. (Shoes like the original Lo Cut and Sal 23 come to mind.) The Marana has only been around about a year and only in the last couple months available in a vegan colorway. At $74.99 its on the high side for a pair of skate shoes. You get what you pay for though and the Marana is a good value. Arguably with a dab of shoe-goo here and there you could easily get six months or more of regular skating out of the Marana. VSB is backing the Marana. 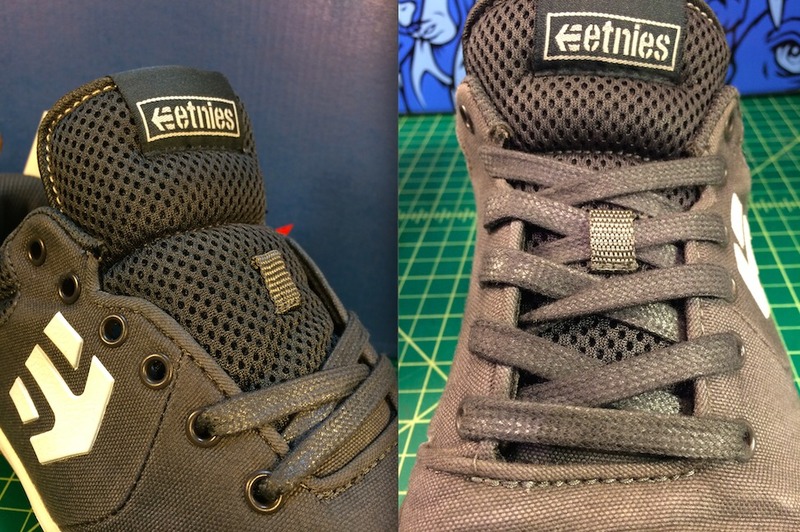 If you like a solid cupsole, Etnies has got you covered. another solid review mr. fakie. I am looking for a more solid and durable shoe. this just might fit the bill. I check your blog regularly for those rare and usually hard to find vegan skate shoes so thank you for your hard work. I just ordered the Marans from CCS. It’s even harder to find vegan shoes that are aesthetically nice as well. 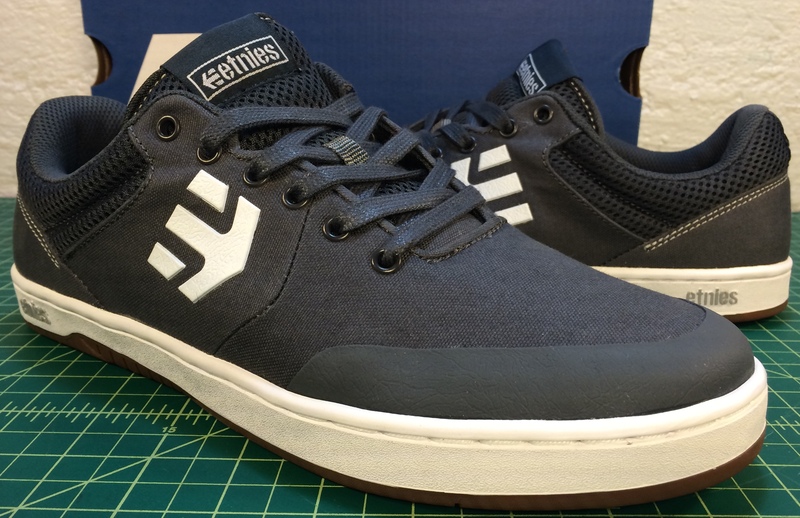 Just a note… I just noticed that these are currently $54.99 on the etnies site. I bought these sometime last year and they are WAY too narrow. They’re uncomfortable to walk in, let alone skate in. 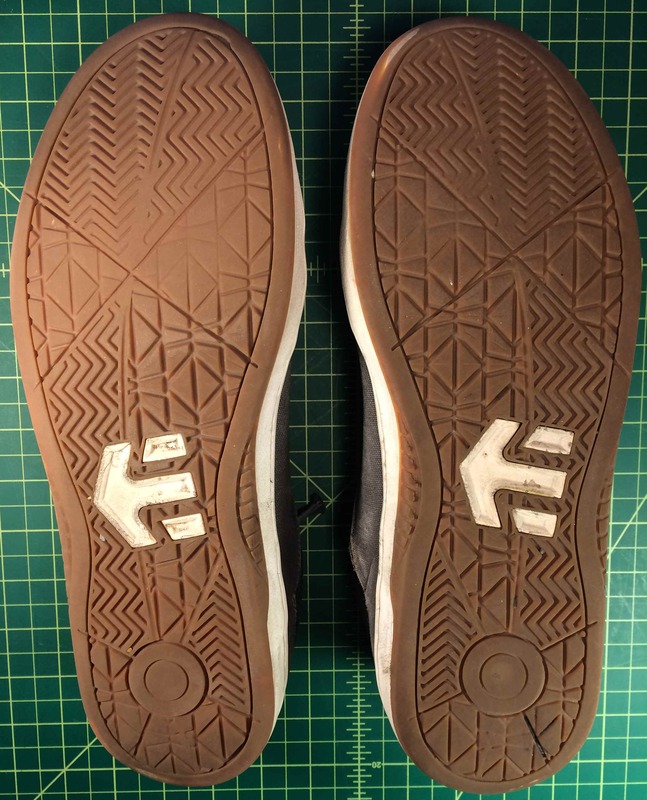 There is also too little room between the bottom of the insole to inside of the tongue (in other words you need skinny AND short feet to fit into these). I swear I don’t have fat feet.